Your Area Chairman and Committee send you all Season's Greetings and good wishes for the New Year. Our Area meeting took place at The Lancastrian Suite last Monday. This is an annual event which all members are invited to attend. The business part of the day was a reflection of the years activities. Retiring committee members were thanked and the incoming members voted upon and welcomed. After a seasonal lunch and some essential shopping at the stalls, the afternoon took the form of a demonstration by Katherine Lee. This event and our Members' Day in May gives us all the opportunity to meet up with friends and to see demonstrations on a larger scale than most of us see at our local meetings. If you have never attended give it some thought as we would be delighted to see you. POISONOUS PLANTS Whilst gardening a Euphorbia plant was disturbed. The sap entered the eye and despite copious eye washes required a visit to A and E and subsequently visits to a specialist eye hospital. After a few weeks of treatment the eyesight gradually recovered and the pain, fortunately, subsided. The danger of plants can never be under estimated. Would you know what to do? We welcome and say many congratulations to three new Area Demonstrators who took their tests in the N.W Area last weekend. The three are Heather Curry, Sean Murray and Katie-Jane Pridmore. Details regarding these demonstrators can be obtained from Area Demonstrators' Representative Val Guest 01325 722373. 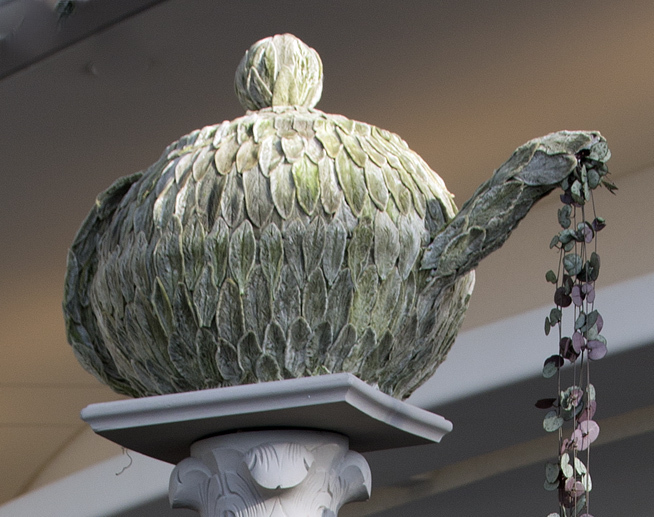 The teapot and accessories on display at Howick Hall Gardens, Howick, Northumberland in the new Visitors Centre. The photograph of Judith's design and the explanation are displayed on the seat of the adjacent chair. The Lindsay Halls residence was filled with fun and laughter for the next three nights.The main activities took place in Keele Hall a superb old building set in beautifully tended gardens. The event started with a fun session introducing everyone to each other on the first evening. Further sessions involved “Weaving A theme” which helped us to produce a presentation which will flow well; “Powerpoint” ; “Pictures with Words” to improve our use of appropriate adjectives and dramatics to help with stage presence and voice projection – much learning done with great enthusiasm by the 45 delegates. Where do our artefacts go after the show? Well in this case after a chat with Howick Hall Gardens and Lord Howick the teapot, memorial ring and other items have been accepted to be placed on show there. 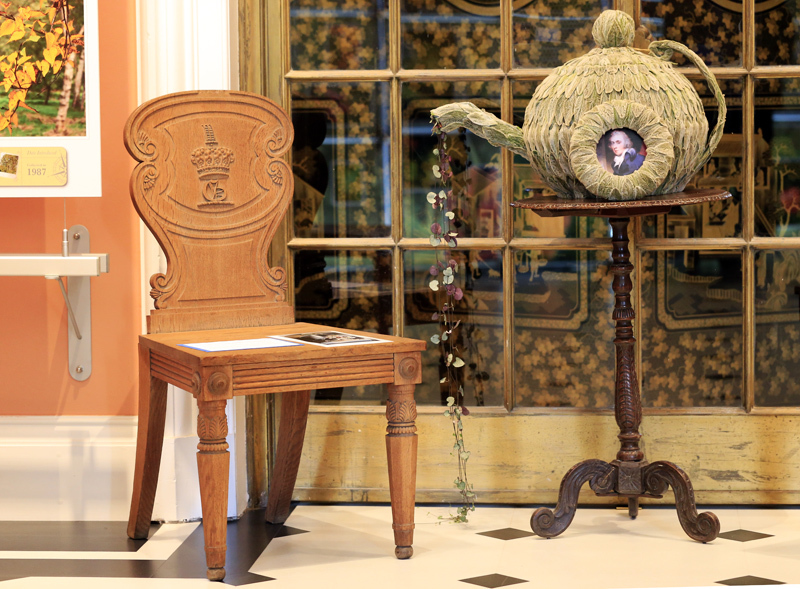 Howick Hall was the ancestral home of Earl Grey so a fitting resting place for these items. Thanks go to Judith Clancy for allowing us to present them to the Hall. A photograph of the design and a brief explanation have been added to the display. AREA COMPETITIONS held at THE SAGE July 27-28 2013 RESULTS. and sponsorship given by Gateshead Council must also be acknowledged. Club with Most Points Alnwick and District. LATEST NEWS from National Competitions Bournemouth results. Congratulations go to Kathleen Dodds 1st in class, Pauline Lund 2nd. in class, Jean Foxcroft 3rd. in class, Dreda Forster and Rita Braithwaite Commended in class. Sally Brass Commended in class. Photography. 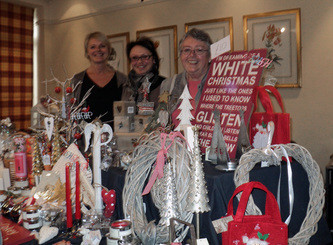 Anne Maw 1st and 2nd in class, Elaine Foreman , 2nd Highly Commended and Commended in different classes. Photos to appear once collected in gallery. Congratulations to ALL who entered for flying the flag for our Area. Gateshead host the European Athletics Team Championship. 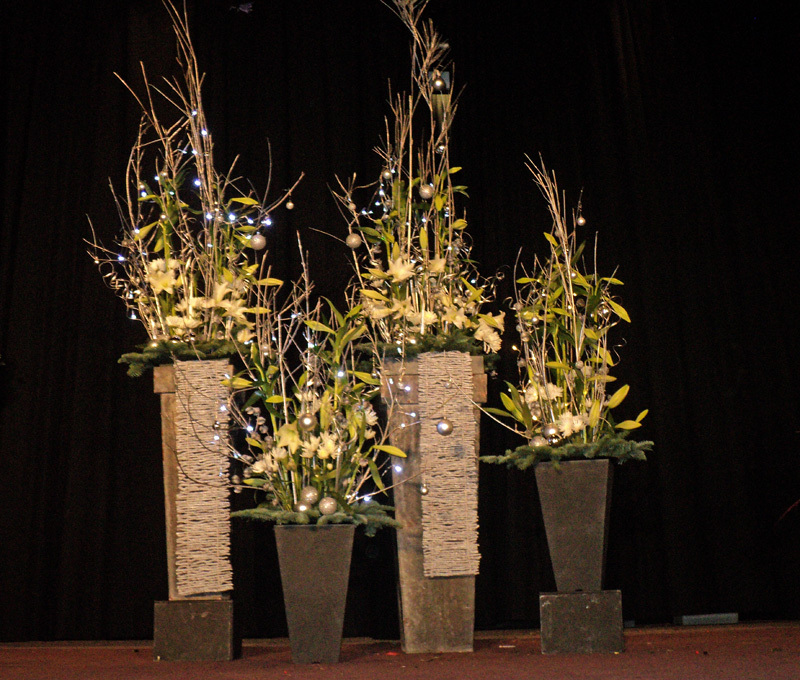 The Area were invited to arrange flowers for this event. A team consisting of Philida Irving,Rita Braithwaite,Pamela Greenhill,Marion Hinchley and Kathleen Marlor undertook this prestigious task on our behalf. The results can be seen in the Photo Gallery. Stannington Fun Day 19 June This afternoon was well attended and no one went away disappointed! The afternoon started with a cup of tea and biscuits and then we settled to watch a cookery demonstration by Marjorie Goodchild. The food produced looked and smelt delicious. 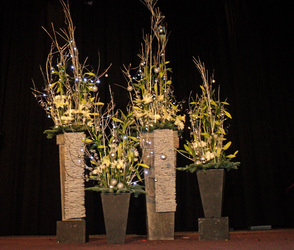 A short break during which time the quiz was attempted and the stage reset for three individual floral demonstrations followed by a 'Ready, steady arrange' event. The results can be seen in the gallery section of this website. Plans are already underway for a similar event next year please watch out for details. Area Workshop. This very successful, fun day was lead by James Burnside. The day was a great opportunity to work with a National Tutor. He demonstrated two designs one a contemporary screen and the other entitled 'Chain Reaction'. These designs were then attempted by ourselves with guidance given willingly by James. The results all looked very different from each other but thanks to his teaching all were very acceptable. 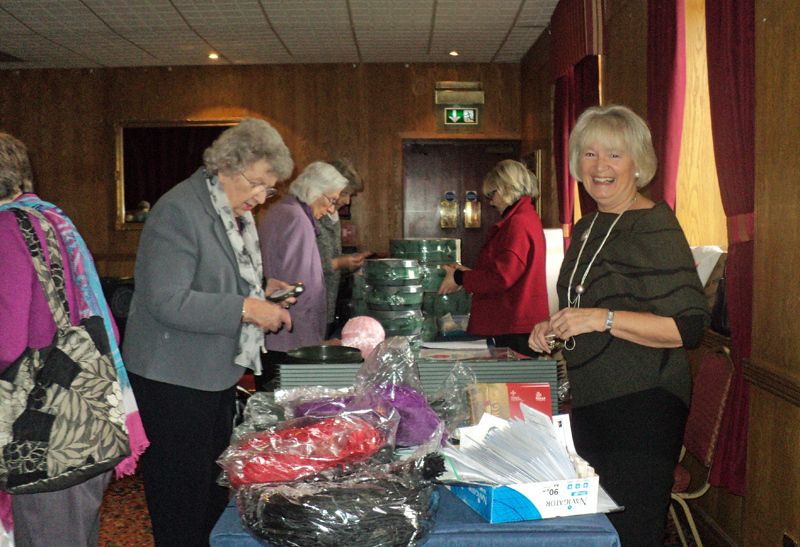 If you were unable to attend this years workshop another is planned for 2014 following Member's Day. 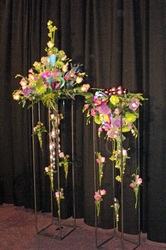 National Flower Arranging Day was held on May 3rd this year. Many Clubs advertised their existence by putting Floral displays in prominent local places for the general public to view. You can some examples on the Photo Gallery page.